Air Deflector for Sidewall Register Discounts Apply ! Wall register air deflectors are an efficient way to redirect air into a room. Redirect air flow by attaching these sidewall deflectors to steel wall registers. The wall register air deflector can be attached by using the provided magnets or use the register screws to attach it. You can redirect air flow to go up or down depending upon how you attach the deflector. This wall register air deflector can accommodate sizes from 10 to 16 inches in length. Sidewall deflectors that redirect air flow are constructed of durable plastic. Wall register air deflector model number 51 cannot be used with the extension sleeve. Also not for use with radiant heat. 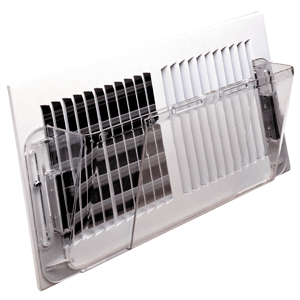 Looking for other options to redirect air flow in your home or office? We have several possibilities available. Wall register air deflectors are an efficient and affordable way to make your home more comfortable, place your order today!